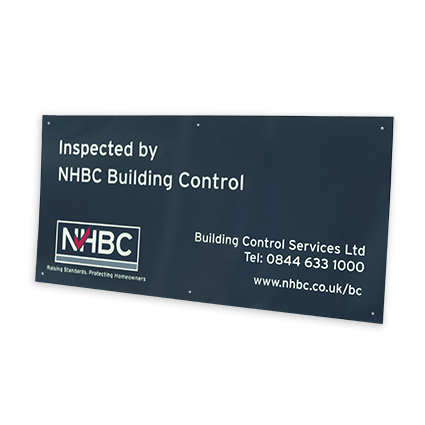 Show that your site has been inspected by NHBC Building Control and demonstrate your professional commitment by positioning this smart, durable NHBC Building Control site board near your site entrance. The NHBC Building Control team will support projects from design to completion. Offering technically excellent, pragmatic and independent advice to help you build and deliver quality homes that comply with Building Regulations, we work extensively on residential, commercial and mixed use schemes as a collaborative partner. Projects will be assigned a local NHBC surveyor as a single point of contact. They will ensure that Building Control is fully co-ordinated with our inspection service, meaning your homes will be handed over promptly. NHBC Building Control provides consistent interpretation of Building Regulations throughout England and Wales and offer a Type Approval service where we can approve a repeat design, building system or feature to speed up subsequent projects.